Royce Chocolates: It’s a season for chestnuts! Reminder: A few hours left to join the Kitchen Cow No Apparent Reason Bento Giveaway! Don’t let the chance pass. 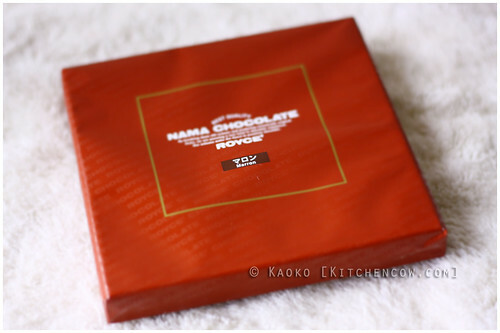 My favorite Royce Chocolate has to be the Nama Chocolate. A rich, melt-in-the-mouth confection of chocolate and cream, it’s worth every sinful calorie. Among the regular kinds, I love the Champagne Nama, but nevertheless, I try any interesting seasonal variants when they come out. It’s the season for nomming! For this season, I spotted a warm brown package, labeled marron. Unfamiliar with the term, I asked the shopkeeper what’s in it. Turns out it’s the perennial holiday favorite, chestnuts! We went home with a box, which we promptly attacked when we got home. It’s easy to fall in love with the marron nama because it’s quite similar to champagne nama. The only thing setting them apart, in fact, is the rich nuttiness the chestnuts bring. Available until the end of December, this seasonal treat will be perfect to enjoy during the holidays. Roasting chestnuts in an open fire is wonderful, but enjoying chestnut nama as you’re tucked under your blankets in bed is quite a delicious experience, too.